In Photo: Ryan Ralston Santos in action. 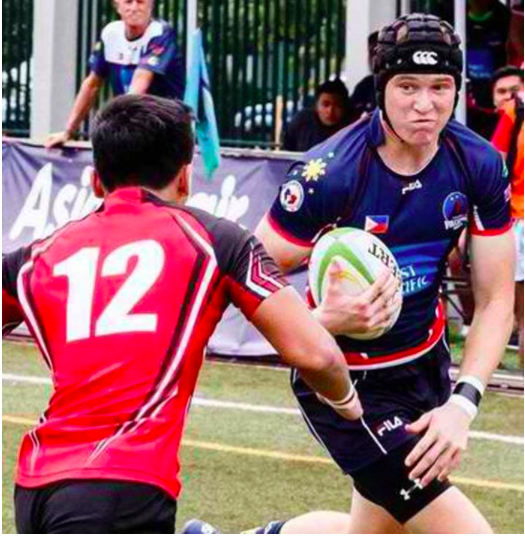 THE Philippine Rugby Football Union (PRFU) has announced its 17-man training roster for the upcoming Under-20 Asia Rugby Sevens Championships. The Philippines will be competing against the heavyweights Japan, Hong Kong, Korea and Sri Lanka in the Asian tournament. “For the U20s, Dave Johnston and I are looking at the PRFU’s future. We want to see who can step up and match it with Asia’s best. Last year we sent a team of 18 year olds to compete at an U20 level. This year we are looking forward to seeing them one year older, one year wiser” Jake Letts, national teams’ head for the Philippine Volcanoes, said. The Philippines have selected the best of both local and international Philippine heritage players. The key members making their return include Rhys Jacob Mackley, Andrew Rodolfo Baldado and Joshua Golimlim Aragon. The U18s captain from 2016, Ryan Ralston Santos, also looks to make his first appearance in the national U20s program. The tournament will be played at Kings Park, Hong Kong, on August 5 and 6. The team is composed of Donald Gregory Anderson, Ethan Chen, Francis Paul Castro, Gabriel Lingan, James Ryan, Jan Philip Ninalga, Jay Vincent Enriquez, Jeff Patrick Ninalga, Josh Miller, Lyndon Cabano-Ang Adlao, Mark Joseph Llanera, Mike Joshua Llanera and Ryan Padilla.